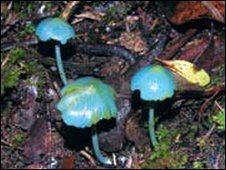 During the same expedition, botanists also came across strange pink ferns and blue mushrooms they could not identify. 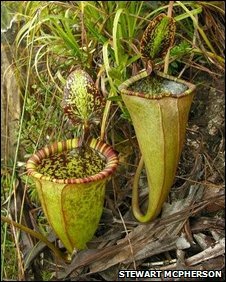 The botanists have named the pitcher plant after British natural history broadcaster David Attenborough. They published details of the discovery in the Botanical Journal of the Linnean Society earlier this year. Word that this new species of pitcher plant existed initially came from two Christian missionaries who in 2000 attempted to scale Mount Victoria, a rarely visited peak in central Palawan in the Philippines. With little preparation, the missionaries attempted to climb the mountain but became lost for 13 days before being rescued from the slopes. On their return, they described seeing a large carnivorous pitcher plant. That pricked the interest of natural history explorer Stewart McPherson of Red Fern Natural History Productions based in Poole, Dorset, UK and independent botanist Alastair Robinson, formerly of the University of Cambridge, UK and Volker Heinrich, of Bukidnon Province, the Philippines. All three are pitcher plant experts, having travelled to remote locations in the search for new species. So in 2007, they set off on a two-month expedition to the Philippines, which included an attempt at scaling Mount Victoria to find this exotic new plant. "At around 1,600 metres above sea level, we suddenly saw one great pitcher plant, then a second, then many more," McPherson recounts. "It was immediately apparent that the plant we had found was not a known species." Pitcher plants are carnivorous. Carnivorous plants come in many forms, and are known to have independently evolved at least six separate times. While some have sticky surfaces that act like flypaper, others like the Venus fly trap are snap traps, closing their leaves around their prey. Pitchers create tube-like leaf structures into which insects and other small animals tumble and become trapped. The team has placed type specimens of the new species in the herbarium of the Palawan State University, and have named the plant Nepenthes attenboroughii after broadcaster and natural historian David Attenborough. 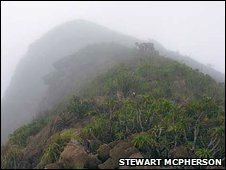 The pitcher plant does not appear to grow in large numbers, but McPherson hopes the remote, inaccessible mountain-top location, which has only been climbed a handful of times, will help prevent poachers from reaching it. 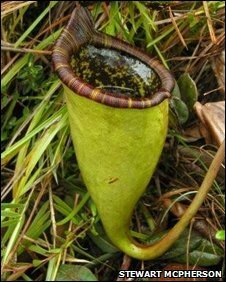 During the expedition, the team also encountered another pitcher, Nepenthes deaniana, which had not been seen in the wild for 100 years. The only known existing specimens of the species were lost in a herbarium fire in 1945. Thought to be a member of the genus Drosera, the sundew produces striking large, semi-erect leaves which form a globe of blood red foliage.